(Natural News) Lemons are zesty citrus fruits rich in vitamin C. When your nose is stuffy or if your throat is sore because of a cold or the flu, you can drink some lemon tea to ease your symptoms. Drink some soothing lemon tea when the weather is cold to warm up and boost your immune system. If you’re not in the mood for a hot cup of tea, you can add some ice to make a refreshing lemon iced tea instead. It’s a good idea to drink lemon tea regularly, especially since it offers various health benefits. Lemons contain certain substances that can help cleanse toxins in the body. Below are six the benefits that you can enjoy if you drink lemon tea daily. Detoxification – The human body will sometimes have deposits of toxins that come from different chemicals found in the food you eat. You can also be exposed to toxins in air pollution. To ensure that these toxins don’t cause disease, you need to detoxify regularly. Drink nutritious lemon tea to aid the process of detoxification. Heart attack prevention – Lemon tea contains flavonoid compounds that help minimize inflammation, which can also prevent the occurrence of blood clots in the arteries. Drink lemon tea regularly to boost health health and lower your heart attack risk. Improved digestive health – Lemon tea is good for your digestive system, and it can help relieve constipation and stomachaches caused by bacteria. This vitamin C-rich tea can also help cleanse the digestive system. Additionally, lemon tea can help eliminate kidney stones. Natural antiseptic – Lemon tea contains substances that have anti-bacterial and anti-viral properties, and they can help defend you from bacteria and viruses that may cause infections. Relaxation – A warm cup of lemon tea has a relaxing and calming effect, which is helpful if you’re very stressed. The drink can ease a stressed mind since tea is full of antioxidants that can help improve mood. Studies show that vitamin C is also beneficial for your mental health. Drink lemon tea regularly to detox, boost your immune system, and improve your overall well-being. Below is an easy recipe for honey lemon ginger tea that you can make if you want a warm, soothing drink when you have a stuffy nose. This tea also contains ginger that can warm you up and clear your sinuses. The honey can also help ease a sore throat. Grate the ginger into a large measuring cup, a medium-sized bowl, or a teapot. You don’t have to peel the ginger, but you need to grate it to enjoy ginger’s medicinal properties. Alternatively, you can just slice it, but this may reduce the “ginger kick” of the tea. Fresh, young ginger is quite tender and it won’t have too many fibers. However, older ginger may have a lot of fiber. Put the ginger in the pot. Pour one cup of boiling water over the ginger and let it steep for three minutes. Get a large mug, then put the honey and lemon juice in it. Strain the ginger tea into the mug. Mix well until the honey is dissolved. You can more honey or lemon juice if you wish. Serve the honey ginger lemon tea hot. A dash of cayenne will produce a spicier tea that can help clear your sinuses. Add a dash of cardamom, cinnamon, or nutmeg when you’re done making the tea if you want a warm spice flavor. Aside from enriching the flavor of your tea, warm spices also offer some medicinal benefits. Add some freshly squeezed orange juice to balance the lemon flavor of the tea. Add turmeric (about 1/4 teaspoon) to boost the healing benefits of the tea. Stir the tea with a cinnamon stick to dissolve the honey. 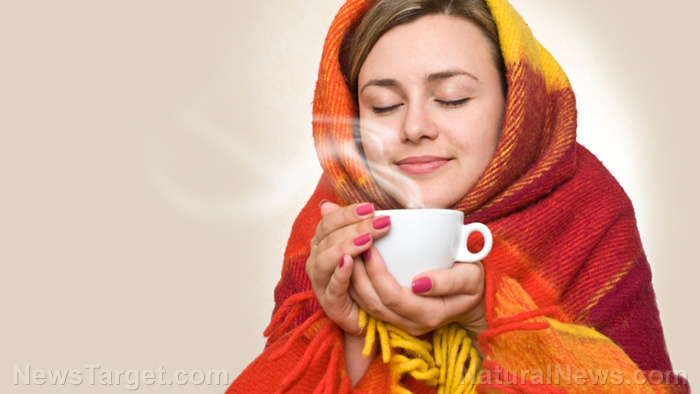 Read more articles about the benefits of lemon tea and other effective natural remedies for colds or the flu at NaturalCures.news. Are Antibiotics Irrelevant Because of Colloidal Silver?